Raptivity - Rapid Interactivity Building Tool: Taking Care of your Device Woes with a Multi Device Utility! Hey everyone, I am sure you must be curious to know what is it that I am going to talk about today. Well, this blog is dedicated to all the device lovers in the eLearning industry. Most of you will vouch for this emerging trend where learners are using different devices to go through the eLearning content. We had sensed this long back when we came up with the HTML5 publishing option for Raptivity. The Raptivity users will also be aware of the fact that creating interactions with different sizes is possible though the target view size feature of Raptivity. But the issue arises when an administrator has to manage different content links for different devices. It becomes a time consuming and tedious process. To ease this issue, Raptivity’s multi device widget allows you to add multiple outputs of the same interaction model with different target view sizes to a single package. This package can be included in your LMS or website. The package has an index page (an HTML page) which automatically detects the device and shows the correct content and in a layout dedicated for a specific device. With the help of this utility, all the above listed published folders will be loaded into a single package. When this package is loaded to any LMS or website and the learner browses the index page, it would detect the device from which the link has been browsed and would show the content corresponding to the recommended target view size. The benefit? Well, with this utility in place, you need not worry about creating separate interactions for each device. A single interaction model can be published in multiple sizes, which eventually blend well with the corresponding device. This utility is complimentary for all Raptivity customers. 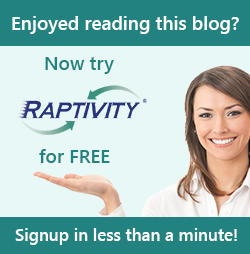 To get this utility, you can write to support@raptivity.com. Do share your experience of using this utility.